DTLA Cheese – Holy Cow! That’s a Great Sandwich! DTLA Cheese recently opened in the Grand Central Market as part of GCM’s ongoing effort to recreate SF’s Ferry Building. In addition to an admirable cheese counter (stocked with Mt. Tam! ), and Sqrl jams, DTLA Cheese has started serving a quick sandwich service. Besha Rodell weighed in on DTLA Cheese recently and gave it a glowing review, so my take is not news. But I had to break my unintentional moritorium to say that the sandwich I had was fantastic. 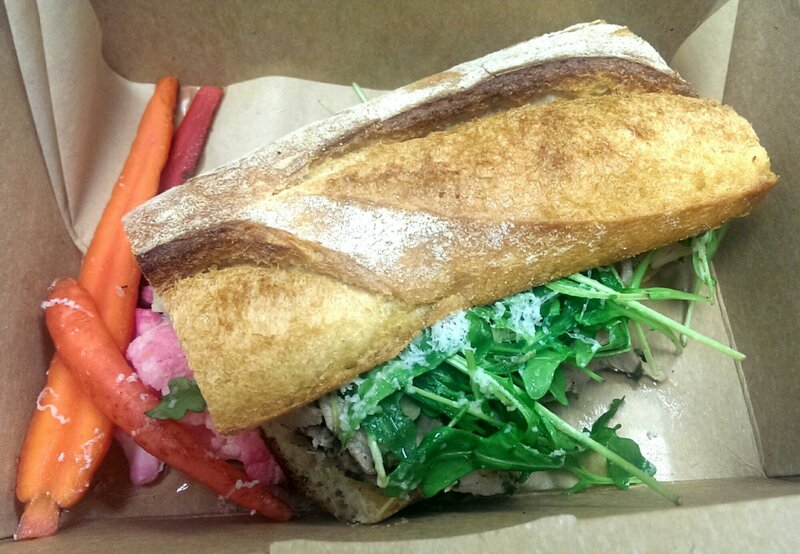 I had the pork loin, which is served on a Bread Bar baguette, with arugula and shaved pecorino. On the side are pickled baby carrots and cauliflower. It was maybe one of the best sandwiches in town. It was similar to the porchetta sandwich that Evan Funke is selling at Bucato (and used to from his food truck). Beautiful thinly sliced pork with a nice pepper crust. Excellent bread from Bread Bar. And the arugula makes for a nice fresh bite, with salt provided by the cheese. The pickled veggies on the side were perfect as a counterpoint. I’ll report back at some point when I’ve eaten through the menu. I’m looking forward to that.